In the year 1853, the railroads between Albany and Troy on the east, and Buffalo and Niagara Falls on the west, by consolidating, created The New York Central Railroad Company. From a very early date each road as it was constructed was regarded both by its promoters and the public generally as part of a through line from Albany to Buffalo. As has been shown in the various reports, each road was constructed in such manner as to fit it for use with other roads in the line. Together they were commonly known as the central line. Upon the completion of the Attica and Buffalo in December, 1842, and before the union at Rochester of the two roads entering that city, arrangements were speedily made for through operation of trains with but the one transfer at Rochester. Conventions of presidents, directors and managers or superintendents, were frequently held to agree upon tariffs, time tables and other details of operation. Agreements were made and carried out for the stocking of cars which have elsewhere been described. The evils of separate management were acutely felt. The Auburn and Rochester and the Auburn and Syracuse were in consequence consolidated in 1850, as were the Tonawanda and the Attica and Buffalo. As early as June, 1842, the Mohawk and Hudson and the Utica and Schenectady were in active negotiation for a common operation of both roads and although they failed to reach a satisfactory basis of agreement, the question came up again and again in the deliberations of the board of directors of the Mohawk and Hudson. The subject of a general consolidation must have been informally discussed by others who were interested officially in railroad affairs. The minutes of the directors of the Utica and Schenectady for October 7, 1847, contain the following: "A letter was read from the Rail Road Committee of the Senate on the subject of consolidating the lines of Rail Roads from Albany to Buffalo. The subject was discussed and it was referred to the President to answer the said letter." Neither the letter nor the answer has been found and nothing appears to have come of the suggestion, whatever it was, but we know from this entry that the thought of consolidation was in the minds of legislators and discussion was taking place. In a convention of all the companies held at Albany, February 12, 1851, the following resolution was adopted and apparently unanimously: "On motion of Mr. Corning, Resolved, that a Committee consisting of the Presidents of each Company on the main line between Albany and Buffalo, be appointed to make application at the present session of the Legislature for a law authorizing any two or more Companies on this Line to consolidate their stock and become one Company if the stockholders representing in value two-thirds of the value of stock of any such companies shall elect to do so." This was two years prior to the passage of the consolidation act of 1853. When that act was finally passed April 2, 1853, the several companies were thoroughly prepared to act, met in a convention with the leading men of each composing the delegates in less than two weeks and the question debated was not to consolidate or not to consolidate, but the terms on which the consolidation was to be made. Such unanimity of feeling on the main question could not have been the result of a sudden springing of the plan, but it must have been the consequence of long experience and much reflection. The two consolidations in 1850, of the roads west of Syracuse had been in effect over two years and their practical working was known to all. The Mohawk Valley and the Syracuse and Utica Direct are omitted from this list as non-operating roads. There were stockholders who owned stock in two or more roads, so that the number of individuals entitled to and receiving stock in the consolidated company was 2,445, scattered widely along the line of the road and elsewhere. No individual or combination of individuals held a controlling monetary influence. Such control as there was arose wholly from the character and standing of the men possessing it and the confidence felt in their ability, judgment and integrity. The unanimity in the action of this great number of stockholders can only mean they understood the reasons underlying and the necessity for a closer union of the roads and a unified management coupled with greater financial ability to meet the pressing problems of the future. The external conditions bearing upon the situation were these. The Boston and Worcester, the Western, and the Albany and West Stockbridge railroads, which later were consolidated in the Boston and Albany, were under one management, had been open to Greenbush opposite Albany since 1841, and afforded an opening to Boston for all the western traffic which could be secured and handled over the line. The Hudson River railroad was opened in 1851, and afforded a like route from Albany to New York City. The New York and Erie, now the Erie, had been completed and opened from New York to Dunkirk on Lake Erie and the line of the Buffalo and State Line, in 1851, thus making it a sharp competitor for the western traffic. The Pennsylvania and Baltimore and Ohio systems were bending all their energies to work into the western states and secure their growing and valuable business. The Buffalo and State Line and its western connections which were ultimately consolidated into the Lake Shore and Michigan Southern had just been opened, afforded a valuable connection at Buffalo for the west, which was, however, tapped at Dunkirk by the New York and Erie. The Great Western of Canada gave promise of making a connection at Suspension Bridge which would command traffic from the Michigan Central at Detroit. In short the opportunities for a large and growing through traffic were great if the line could be put in condition to handle it despite the keen competition of roads lying to the south. The canal tolls had been abolished so that incubus was removed. The grades were favorable and superior to those of the competitors, thus affording an advantage in cost of operation. The paramount question was whether the roads constituting the central line were in a condition to enable it to handle and hold the through traffic which plainly lay within its power to obtain. They were not. The facts supporting this statement are easily presentable. The New York Central, according to its reports to the state, in the first year of its operation ended September 30, 1854, expended in construction and new equipment, $3,862,845.16; in the second year ended September 30, 1855, $1,453,356.64; in the third year ended September 30, 1856, $2,425,661.45, a total of $7,741,843.25. On an examination of the line of the Road immediately after the consolidation, it was found that large portions of it the iron was badly worn, many of the chairs were badly broken or none had originally been used and the ties and bridges needed very general renewal; with one or two exceptions the materials and supplies were also of the most limited extent. Since that time, very extensive repairs have been made. A large part of the Superstructure has been renewed and the whole line placed in the sound condition requisite for the transaction of the large business the Company is now doing. The stock of materials and supplies has been largely increased and (maintained at the present point) will be sufficient to meet the constant demand for the uses of the road. This expenditure in three years time is conclusive evidence as to the necessity for remedying the condition reported by the chief engineer. In the estimate on which the consolidation was based as will be seen later, the committee took into consideration the fact that the road west of Syracuse had but a single track and estimated that $2,281,000 would be required to construct a second track. Some of the details of these additions and betterments are important. From the first of May, 1853, from which time the real working of the consolidated road dates, to September 30, 1855, a period of two years and five months, locomotives were increased from 139 to 190; baggage cars from 48 to 62; passenger cars from 159 to 222; freight cars from 1028 to 1852. Some retirements were made from the old stock, locomotives 2, passenger cars 13, freight cars 3. Buildings. At Albany a brick freight house, 180 feet long, two stories high, and an 18 stall brick engine house. At West Albany extensive yard tracks, and cattle pens, three car houses for passenger cars each 335 feet long of brick with slate roofs. At Schenectady a large freight house. At Utica an addition to the engine house equivalent to room for 12 locomotives. At Syracuse an enlargement to the tunnel under the canal so as to permit two tracks, a second track through the city and enlarged freight accomodations. At Auburn, new engine house and shops. At Rochester a new brick frieght house 300 feet long, a new engine house of brick, capable of holding 20 engines, addition to the blacksmith shop 100 feet in length, an addition to the machine shop 150 feet in length, a boiler shop, new bridges over Genesee river, Brown's mill race and under St. Paul Street. Previous t the rebuilding, there was but one track for most of the distance across these bridges, rebuilt with three tracks; the passenger depot was also completed. At Batavia, a new brick passenger station, the one now in use there. At Buffalo a large and commodious freight house 600 feet in length and 170 feet in width, fronting on Buffalo harbor, in what is now the Ohio Street yard. The greater part of the land for this yard was purchased at an expense of $260,150. Its dimensions were, on the harbor 816 feet, on Ohio Street 898 feet, average depth 158 feet. The acquisition of this yard and the erection of buildings and other additions diminished the freight operating expenses at this point about sixty-six per cent. At Suspension Bridge, a passenger station 150 feet in length, a freight house 300 feet in length, another freight house 900 feet long, accomodations for live stock greatly enlarged and improved. At intermediate stations, 15 passenger stations, 7 freight houses, 13 water houses, and 12,850 feet of woodsheds. Second tracking. This had been greatly progressed but not wholly completed. All the grading, masonry and bridging completed, except about 10 miles between Syracuse and Rochester, and 8 miles between Rochester and Byron. The original Tonawanda right of way from Rochester to Batavia was not sufficiently wide for a second track and additional land had to be bought. Iron rails had been laid on 72 1/4 miles of second track. At West Albany 126 acres of land were bought for a yard at a cost of $31,500 and a contract made for 97 additional acres at the same price, $250 per acre. Of the millions required for all this new work, it is well to note that the following sums were received pursuant to the consolidation agreement. That the strong and experienced business men who made up the directorates of the consolidating companies did not understand the situation requiring the great outlay here outlined and did not enter upon the consolidation as a means of bringing the central line up to the condition required to take care of the growing freight and other business, and thus meeting their duties to the public, must be regarded as surpassing rational belief. That the individual roads operating separately could not meet the situation is certain. Only five years prior to the consolidation they had strained their resources and credit to the utmost in reconstructing their tracks with iron rail, an indispensable improvement, and now they faced the problem of replacing much of that rail which by reason of its softness had become badly worn. The roads west of Syracuse, having but a single track, required a double track. The Buffalo and Rochester could not be charged with the expense of the Ohio Street yard and freight house designed to care for through business in which all the roads would share, nor could the Albany and Schenectady finance the West Albany yards which were demanded for the benefit of the through business. Above all that, through business, both passenger and freight, could not be handled as the public demanded by eight different operating roads under different management and superintendence. That experiment had been tried for ten years and had not worked to the satisfaction of either the public or the companies. It is a work of superrogation to discuss the merits of consolidaton of small railroads into a larger system in the year 1926. Experience has demonstated all the advantages and disadvantages during over seventy years, until the public, once suspicious and distrustful, is insisting on forced consolidations, if voluntary ones are not forthcoming. The railroad men of 1853, out of hard earned and costly experience had learned the necessity of union, precisely as the states of 1787, out of a like hard experience had been taught the necessity of a better political union. The situation, then, in 1853, which confronted the management of the existing roads was a rapidly growing business with every prospect of an indefinite future expansion, facilities inadequate to meet such growth, a practical impossibility for the separate roads to finance the additions and betterments required to meet their public duties, inability of the terminal raods at Albany and Buffalo to provide adequate terminal facilities and yet compelled to prorate earnings from through business mostly on a mileage basis and above all, operation carried on by eight separate roads each under its own management, with its own standards of discipline, repairs and maintenance. Unification was an economic necessity required by economic causes. It was not a device invented by any one for ulterior purposes. Its consideration was forced by pressing needs which had impressed themselves upon the minds of all dealing with the subject. The total absence of all discussion as to the desirability and the necessity of a union conclusively proves that all were agreed upon that. when the time for action arrived, the only point debated was how the union could be made, upon what terms the several roads should unite their properties, what representation in the new company the stockholders of the existing companies were to receive. In 1853, there was no general law in the state of New York authorizing the consolidation of railroad corporations. A special act, Chapter 76 of the laws of 1853, was passed by the legislature and became a law April 2. Section 1, authorized the Albany and Schenectady, Schenectady and Troy, Utica and Schenectady, Syracuse and Utica, Rochester and Syracuse, Buffalo and Lockport, Mohawk Valley, Suracuse and Utica direct, Buffalo and Rochester, Rochester, Lockport and Niagara Falls Railroad Companies or any two or more of them at any time to consolidate into a single corporation in the manner following. The directors of two or more of said companies might enter into an agreement under their respective corporate seals for the consolidation of the said corporations, prescribing the terms and conditions thereof, the mode of carrying the same into effect, the name of the new corporation, the number of directors thereof, which should not be less than thirteen nor more than twenty-three, the time and place of holding the first meeting of directors, the amount of capital and the number of shares of the stock of the new corporation which should not be larger in amount than the aggregate amount of capital of the several companies thus consolidated and should not be increased except in accordance with the general railroad law, the manner of converting the shares of capital stock of each of said corporations into the shares of the new corporation, the manner of paying any shareholder that might decline taking shares in the new corporation with such other details as might be deemed necessary. Such agreement was not to be deemed the agreement of the corporations until after it had been submitted to the stockholders of each corporation separately at a meeting to be called upon a notice of at least thirty days, specifying the time and place of such meeting and the object thereof, to be addressed to each of the stockholders when the place of residence was known and deposited in the post office and published for at least three successive weeks in the state paper and in one fo the newspapers printed in each of the counties through or into which the railraod of the said corporation should extend, and had been sanctions and approved by such stockholders by the vote of at least two-thirds in amount of the stockholders present at such meetings respectively, voting by ballot, either in person or by proxy, each share being entitled to one vote. When the agreement had been so sanctioned and approved it should be deemed the agreement of the several corporations. Section 2, provided that a duplicate of the agreement should be filed in the office of the Secretary of State and that immediately after the first election of directors the corporations should be merged into the new corporation. Section 3, prescribed the general powers of the new corporation to be those expressed in certain provisions of the Revised Statues and the general railroad law of 1850. Section 4, provided that all the property of the old corporations should vest in the new corporation without any other deed or transfer and that the title to real estate should not be deemed to revert or be impaired by the consolidation. Section 5, provided that the rights of creditors should not be impaired and that the new corporation should be liable for all the debts and liabilities of the consolidating corporations. Section 6, prescribed the method of appraising the stock of any stockholder who should at the meeting or within twenty days thereafter object to the consolidation and demand payment for his stock. When any two or more of the railroad companies named in this act are so consolidated, said consolidated company shall carry way passengers on their road at a rate not to exceed two cents per mile. Section 8, provided that the act should take effect immediately. Resolved, that a committee consisting of E.C. McIntosh, R.H. Winslow, Thos. Tileston and H. Pumpelly be appointed with full powers to represent this Company, to act and conclude an arrangement for consolidation of the stock and interests of this Company in accordance with an Act of the Legislature of the state of New York passed March, 1853. We may easily infer this resolution was drawn after the bill had passed both houses of the legislature, but before the act became a law, since the date of its passage is left blank, but named as being in March. Laws are identified as having passed on the date they became a law. We should note also that the committee was given full power to make and conclude an agreement without being required to refer a proposed agreement back to the Board for approval. The same power was conferred upon its committee by every other company except the Syracuse and Utica. Evidently there was great desire to have the business done and done speedily. The minutes of the Utica and Schenectady show that the Secretary on April 5th, laid before the Board a certified copy of the act and that, "The President stated that he had been informed that several of the companies named in the Act had already appointed Committees on this subject." Whereupon the Board appointed a committee of four and because any agreement must be approved by the stockhoolders before it could take effect, resolved, "that the said Committee have full power on the part of this Company to enter into any agreement for such consolidation which they may deem proper." A meeting of the committes was called merely by suggestion. John V.L. Pruyn, secretary of the Utica and Schenectady on the same day, April 5th, sent a letter to each of the other companies advising that his company had appointed a committee for the purpose of the act and continued, "and it was agreed to recommend to the several Companies that the Committees appointed by them on this subject should meet at Syracuse on Tuesday next, the 12th instant, at Four o'clock in the afternoon." The committees met at the time and place specified. No delays were to be tolerated. Preliminary conferences were not thought of. Action, prompt action, was the order of the day. 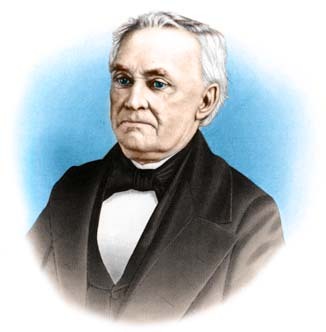 The meeting was called to order by Erastus Corning, president of the Utica and Schenectady, and on his motion Henry B. Gibson, president of the Rochester and Syracuse was made chairman. John V.L. Pruyn was appointed secretary. These delegates also represented the Mohawk Valley. These delegates also represented the Syracuse and Utica direct. Resolved: That sub-committee be appointed of one from each road to report a plan of consolidation for the consideration of this meeting, and that each Company name its own member of the said Committee. The meeting then took a recess until 8 p.m. to enable the sub-committee to enter upon its duties. We may at this point observe that there was an entire lack of discussion as to whether a consolidation was advisable. Every company was committed to that. The only matter open for discussion was on what terms the consolidations could be made. Upon this point it is well to consider somewhat carefully what the problem was with which the committee was to struggle. Here were ten companies agreed that it was desirable from every point of view to throw all their property into one common ownership. An inescapable condition of such common ownership was that, except dissenters under Section 6 of the consolidation act each stockholder of each company must surrender his stock and ownership in an existing company and accept in lieu thereof stock in the new company. There were over twenty-four hundred such stockholders. Without the assent of two-thirds in amount of the number present at the ratification meeting no consolidation was possible. It could not be assumed that any stockholder would assent unless he believed he was getting a just equivalent in the company for what he surrendered in the old. If his stock were worth any given sum, say $10,000, he must be made reasonably sure he would get a representation stock worth an equal amount, or else he would know injustice was done him. Accordingly he must be assured he was not getting less than his proper due and also that no one was getting more than his proper share. If the stocks of all these companies had been of equal value and that value was par, the question would have presented no difficulty. One share of the stock in the new company would have been of the value of one share in any of the old companies. But the shares of the old companies were not of equal value. They did not sell for the same in the market; they did not command the same in dividends; they had not been alike profitable in the past, and the future under the sepraate managements did not give promise they would ever be of like value. It was not the old companies which were to take the stock of the new company. It was their stockholders and the commonest principles of equity demanded that they should all be treated justly, no one getting either more or less than that to which he was justly entitled. Issuing of stock share for share was absolutely out of the question and as the event proved was so regarded by everyone. It followed that the committee's task consisted in devising some scheme by which each stockholder would get his just proportion in the new company without exchange of share for share. The consolidation act declared that the capital stock of the new company should not exceed the aggregate amount of the capital stock of the old companies and thus in practical effect restricted the number of shares which could be issued by the new company. All these considerations show that the paramount question to be solved by the committee was how much value was being put into the common pool by each of the consolidating companies, for upon the value of the property of any given company depended the value of a share of its stock. So the primary question was vaalue. Now at that time economic thought had been developed only to the point where people knew what they meant by value. The idea of value so ineffable that it could not be defined, that the process of ascertaining it was so mysterious and indefinable that it could not be explained, was then wholly unknown. That conception of value, if so it may be termed, did not arise until sixty years later. Whether it will be found practical and workable in present day consolidations, either voluntary or forced, remains to be seen. But surely we must interpret the transactions of seventy years ago by the dim light of those who believed the value of their property was what they could sell it for, or found from the size of the return it yielded them. While this point is fresh in mind, it is impossible not to wonder what will be the view of one who owns a block of railroad stock which yields him a six per cent return, when he is asked or commanded to put it in on parity with the stock of another which has never yielded and does not now yield any return whatever. Will he or will he not feel that getting, say a three per cent return instead of six, savors very strongly of confiscation, and will he or will he not instruct his lawyer to inquire what remedy he has? We have pointed out that the sub-commmittee did not have a free hand, although sent out by the meeting without instructions. They were compelled to meet and deal with certain insurmountable restrictions and limitations. They were forced into a narrow path and if they stumbled therein, their work would be in vain. Unless the situation in which they were placed is thoroughly understood and appreciated, no just judgment can be passed upon the fruit of their labors. The committee, composed of the ablest and most experienced men in the conveniton, struggled long and earnestly with the problem before them. They were not able to report until 4:30 p.m. of the 13th. Then Mr. Corning as chairman of the committee submitted a verbal report accompanied by a statement of the amounts proposed to be allowed on consolidation to the respective companies which had been agreed to by all the companies except the Syracuse and Utica and the Rochester and Syracuse, the former claiming an allowance of 53 per cent premium on their stock instead of 45 proposed to be allowed them; the latter claiming 35 per cent premium instead of 30 per cent to be allowed them. Resolved: That all the companies heretofore named (except the Syracuse and Utica Company which has declined acceding to the terms proposed) do hereby agree to consolidate their respective companies into one corporation under the Act of the Legislature aforesaid on the general principles reported by the Committee. The value of the Troy and Schenectady road to be determined hereafter in a manner satisfactory to both parties or otherwise the said road not to be included in the consolidation. Mr. Stryker, then on behalf of the Syracuse and Utica, stated that that company would consent to come into the consolidation provided the premium to be allowed on its stock be increased from 45 to 50 per cent. 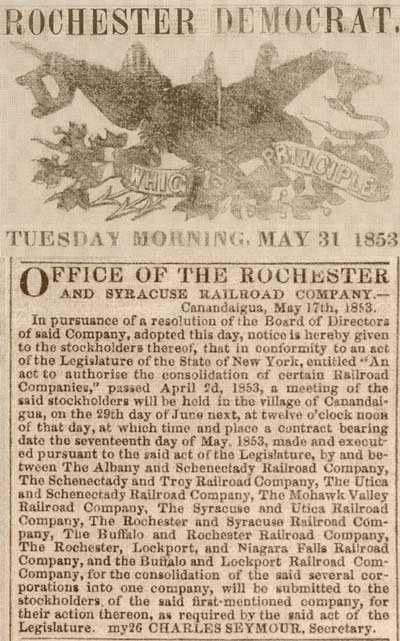 After considering the same, and Mr. Gibson, the chairman, having, on behalf of the Rochester and Syracuse Company, expressed the wish that the proposition be accepted, the same was adopted and it was resolved that the Syracuse and Utica be admitted into the consolidated company. It was then resolved that a committee be appointed, one from each company, to prepare for execution the draft of proposed Articles of Agreement, for the consideration of the several companies, and to do all things requisite so far as may be in their power to perfect the consolidation and to decide upon all matters in regard thereto, until the same shall have been finally completed by the election of directors of the new corporation, that four members of the committee regularly convened should be a quorum and that each company name its own member. It was further resolved that the said committee have power to decide upon the terms on which the Schenectady and Troy should be admitted into the consolidation. Mr. Corning moved, which was seconded by Mr. Wilkinson, that the valuation of each road as already agreed upon be reduced ten percent. Objections were made from several quarters and as the modification proposed required at this time the unanimous consent of all the parties no question was taken upon the moment. Albany and Schenectady $1,624,865.00 . and Mohawk Valley 6,075,000.00 . Straight Line (+ $300,000) 3,300,000.00 . Schenectady and Troy 520,000.00 . Rochester and Syracuse 5,605,700.00 . Buffalo and Rochester 2,281,000.00 .
paid for at par 719,000.00 . Rochester, Lockport, Niagara Falls 2,093,600.00 . Buffalo and Lockport 675,000.00 . The foregoing is a complete report of the proceedings of the convention, except that the minutes were read and approved. It is well at this point to consider just what was done and what was not done at this convention. First; it was determined to consolidate, but upon this there was absolute unanimity at the outset, dependent only upon the terms which could be arranged. Second; a committee was appointed to report upon those terms and the only subject it reported upon was the valuation to be given to each road in forming the union. It was this question which engaged the labors of the committee. Upon this question two companies dissented from the report as to the value assigned their own roads, but raised no objection to the value given any other road. One of the these companies accepted the report. As to the other, a compromise was made by general concurrence. Third; the Utica and Schenectady and the Mohawk Valley were treated as one, and the same treatment was extended to the Syracuse and Utica and the Syracuse and Utica Direct, without the slightest objection from any one. It would seem to be incredible that in a struggle for a just and acceptable relative valuation, there should have been no objection to premiums on their stock unless there was something in the situation which rendered it equitable as between the companies themselves. Each company was actively endeavoring to obtain for itself a just relative valuation as is shown by the objections to the report. A premium of 55 and 50 per cent respectively to these companies without roads would have been unthinkable under these circumstances unless there was something in their treatment in connection with that accorded to their principals which rendered it acceptable as between the companies themselves. What this something was is clearly a matter to be investigated. Fourth; that we have not erred in considering the report of the committee as a matter of valuation is shonw by the consolidation resolution which expression says, "The value of the Troy and Schenectady road to be determined hereafter" &c., and by the motion of Mr. Corning seconded by Mr. Wilkinson "that the valuation of each road as already agreed upon be reduced ten per cent." A further point to note at this time to be developed later is that in taking the value of the roads as the basis of consolidation and not the cost or the capital stock and funded debt, they set an example which is now followed by every court and commission in the country and forms the basis upon which the United States government and the railroad companies of the country must justify themselves for an expenditure of upwards of one hundred millions of dollars in the past thirteen years. Their method of ascertainly value may not have been the same as that now chiefly used, but it certainly accorded with that favored and used by the business world then and now. We may note further that when this question of value was settled satisfactorily, nothing further engaged the attention of the convention except to provide the machinery for working out the details of the consolidation, giving to the committee appointed full power to settle every question. We must next, therefore, follow the transactions of that committee. Resolved; that a circular be addressed to each Company requesting them to close their books on the evening of the 30th day of April, instant, and thereafter to keep all their accounts separate from previous transactions, to the end that when the consolidation shall take place it may effect from and after the said 30th day of April: and also requesting each Company without delay after that date to furnish this Committee with a particular and detailed statement of its property which will pass to the consolidated Company as the same may exist on that day and of all liabilities, direct and contingent, on the day above mentioned. Resolved; that it be provided in the agreement for consolidation that the consolidated Company purchase the stocks in the Great Western Rail Road Company, Canada West, and in the Buffalo and State Line Rail Road Company, held by any of the present Companies, the former at par and interest at 6 per cent from 1st January last and the latter at market value at this time to be ascertained hereafter and that the consolidated Company pay for said stock in its bonds at such time and rate of interest as shall hereafter be agreed upon. "Rsolved; that Mr. Pruyn be requested to prepare the draft of the agreement of consolidation to be submitted to this Committee." "Resolved; that the Chairman be authorized to call meetings of this Committee at such time as he may deem proper." The committee met pursuant to adjournment at the office of Mr. Pruyn in Albany on the 4th day of May and continued in session that and the two subsequent days. Mr. E.D. Morgan, five years later elected governor of the state, appeared as substitute for Mr. Sage and there was also in attendance the whole or part of the time the following persons, directors, or officiers of the old roads; Dean Richmond, R.H. Winslow, G.H. Mumford, Horace White, J.W. Drummond, E. Foster, Jr., A.C. Paige, Chauncey Vibbard, J. Rathbone and M.T. Reynolds. Edwin Dennison Morgan (1811-1883) Soldier, lawyer, governor, United States senator. In 1849 he was chosen an alderman of New York city; during the same year was elected to the state senate, and served two terms. In 1858 he was elected governor of New York, and re-elected in 1860, in 1861 he was appointed major-general of volunteers, and, although he rendered much service, declined all compensation. In 1863 he was elected a senator in congress from New York for the term ending in 1869. The first evening Mr. Pruyn submitted a draft of the articles of association which was discussed at length. May 5, at 9 a.m., the committee met and further discussed the draft prepared by Mr. Pruyn and made some amendments thereto. The number of directs was after discussion fixed at thirteen. The statements of the affairs of the companies requested at the April meeting were taken up and discussed in detail. At 2 o'clock p.m., the committee took a recess for an hour and a half. At 3:30 it met and discussed the agreement with great particularity until 6 when it took another recess until 7:30 at which hour it again convened, and discussed certain car accounts and claims presented by the Albany and Schenectady. Having disposed of these, they resumed examination of the agreement and at 10 p.m. adjourned until 9 the next morning. At the appointed hour on the 6th, they resumed examination of the agreement, continued thereon until 2 p.m. and then took a recess until 3:30, at which hour they again met, appointed a committee to procure certificates for the premium allowances, a committee to accept options for land purchased by the Mohawk Valley Company, a committee to reduce the fare of western through passengers, a committee to negotiate with certain other companies in western New York on matters not specified in the minutes and finally completed the examination of the agreement, having settled all the questions arising in regard to it. Mr. Pruyn and Mr. Paige were requested to revise the agreement as finally settled and to have the same printed without delay. The 17th of May was fixed upon as the time for signing the agreement, the companies east of Utica to meet at Albany in the morning and those west of Utica at Syracuse in the afternoon. The stockholders' meetings to pass on the agreement were appointed to be held June 29, at such place as each company might appoint. On the 17th of May the directors of the several companies met at the cities specified and duly executed the articles of agreement as prepared by Mr. Pruyn and revised by the committee. The committee also met informally at Syracuse May 17, and transacted some routine administrative business. Among other things Mr. Conring and Mr. McIntosh were authorized to construct an additional freight depot at Albany and Mr. Corning and Mr. Wilkinson were authorized to contract for ten baggage cars. They met again at Buffalo Jun 8, appointed a committee to inquire into the propriety of extending the passenger and freight depot grounds in Buffalo and to make preliminary negotiations for the lands required for these purposes. Messrs. Corning and McIntosh were appointed a committee to purchase such additional lands at Albany as were in their judgment needed for the purposes of the company. Some other administrative business was transacted. These persons met at Albany, July 7, and organized by the election of Erastus Corning, as president, Dean Richmond, as vice president, and John V.L. Pruyn, as secretary and treasurer. Resolved: that the Executive Committee be authorized to take measures for laying a double track on the direct line of road from Syracuse to Buffalo as soon as the same can in their judgment be most advantageously accomplished and to adopt all such measures as they may on examination deem necessary to put the entire line of road from Hudson's River to lake Erie with its rolling stock and machinery in the very best condition. A duplicate of the consolidation agreement was the same day filed in the office of the Secretary of State and thus on July 7, 1853, The New York Central Railroad Company came into existence. The new Company (the New York Central) elected its first directors on the 6th of July, 1853. The occasion was one of great interest as the consolidation with its attendant circumstances had largely attracted public attention and was the subject of much comment. Mr. Corning held a large majority of the proxies. The Board he elected lived entirely on the line. I was in favor of taking one director from New York and one from Boston and Mr. Corning had almost down to the last determined to take this course but some of the gentlemen on the line, and particularly Mr. Gibson, urged him strenuously not to do it and he, reluctantly I think, yielded. Mr. Varnum of New York, who had been prominently spoken of as one of the new Board, he informed me had assented to this course. I was very laboriously occupied during this spring and summer in the proceedings consequent upon perfecting the Consolidation fo the Rail Roads, and the formation of the New York Central Rail Road Company. The labor of drftin the Consolidation greement devolved upon me, which as it probably involved a larger amount of our property than had ever formed the subject of an agreement in our State, was one of great responsibility. I had the draft printed and it was revised by Judge Paige who acted as Counsel, and I also sent it to the different gentlemen who had attended the meetings at my office to settle upon the detail of its provisions, (and some others interested) that they might examine it and make such suggestions as they thought proper before it was engrossed. These gentlemen were Mr. Corning, Mr. M.T. Reynolds, Mr. Gibson, Mr. Richmond, Mr. Wilkinson, Mr. McIntosh, Mr. Plumb, Mr. Winslow, Mr. Morgan of New York and several others. The question as to the number of Directors was one considerably discussed. Mr. Reynolds took strong ground against more than 13. I advocated a larger number in order properly to represent the different interests -- 18 I thought would have been better. The smallest number was agreed to. When the agreement was drawn, I kept this clause open, and might have had it altered at the last moment, but Mr. Reynolds objected in the Utica and Schenectady Board to leave the matter open, and we had to close it at the number agreed upon. The sinking fund provided for by the agreement to meet the (nearly) nine millions of dollars of debt certificates was a provision which I thought prudent to meet so large a debt. I believe that this was entirely my suggestion, and it will form a marked feature in the future history of the road. The principle of providing gradually for the extinguishment of the debts of Rail Road Companies is a very important one, and as long as reduction is going on, although very slowly, the Company is benefited and public confidence increased. The fund is based on the calculation that 1 1/4 per cent per annum (its amount) will in 30 years, (at the end of which time the certificates mature,) with accumulated annual interest at six per cent, amount to the total of the debt -- a result which if proper attention be paid to the matter I think there will be no difficulty in securing. I was elected Treasurer and Secretary of the new Board. I said to Mr. Corning that I did not wish the appointment as it might interfere seriously with my professional business. The Company needed the services of a lawyer, and one of some experience in the affairs of the line, such as I had acquired while acting as Treasurer of the Utica and Schenectady Rail Road Company, as its organization, the issuing of new stock certificates, etc., etc., would bring up many legal questions. I of course was not with the Board when the question was discussed, but was called upon by Mr. Gibson and Mr. Paige as a Committee and requested to take the office. The question of salary was of course raised. I said that if it took me out of my profession I would not take less than Ten Thousand Dollars per annum, but I wished to retain my hold on my profession and to go occasionally into Court, and if I could do this, would accept Eight Thousand Dollars per annum. I do not wish to give up my profession and therefore only go into this long enough to organize it thoroughly, and see it well started in its operations at least in my department. Having full traced out what was done in effecting the consolidation we are now ready to consider upon what basis or bases it was done. It is essential to all consolidations or union of property interests that the union proceed upon some settled principle which the parties believe will ensure to each interest a just and adequate proportion of the whole. Unless each party to the transaction believes this has been substantially secured to him, no voluntary agreement is possible. The more parties there are to the arrangement, the greater the difficulties to be overcome. In the case in hand ten corporations were endeavoring to throw their properties into a common pool and no one could feel sure it was getting its proper per cent of the total without having some definite knowledge as to how the total as stated in dollars was arrived at. If the interest of one party is overstated, it necessarily results in loss to one or all the others. Accordingly, each part, if it proceeds intelligently, must have or think it has, adequate knowledge of what each of the others is justly entitled to for what it brings into the common ownership. This necessitates some standard of judgment which applies to all the properties, since if a yard stick of one length is applied to one, and another of different length to another, there can be no test of their relative importance. If a carpenter were to attempt to build a house or a machinest a locomotive, using for some of the parts measurements according to the metric system and for others measurements according to our standards of feet and inches, the result can be readily appreciated without any elucidation. So the great problem at the Syracuse meeting was to agree upon and use some common basis of judgment which would give to the stockholders of each company a just and fair proportion of the securities to be issued by the new company for the property it received from all. There were several bases theoretically possible; (1) purely arbitrary agreement; (2) cost of property; (3) its appraised value; (4) its earning power; (5) the market value of its stock and bonds. As to the first it was literally out of the question. Two parties may do business in that manner, with ten it is practically impossible even if dealing with their own property. In this case the negotiators were merely trustees for thousands of others, the concurrence of two thirds of whom was necessary to give validity to any agreement entered into. The hard headed business men composing the convention could never have reached an agreement except upon a basis which they considered reasonable. As to the other possible bases, it can not be overlooked that the real queston involved was the value of the properties involved. Transfers of property and adjustments relating thereto depend for their terms upon value. Only one notion was entertained concerning value in 1853, and that was power in exchange, what it would command from a desirous purchaser. Hence appraised value would in those days be only an estimate of the extent of such power based upon such evidence as the appraiser considered material. An appraised value which does not take into consideration earning power when exchange value is to be ascertained would be ridiculous. So another test of present value of a corporation is the price its stock will command in the open market. It is obvious that the convention and its committee did not consider an appraisal on the basis of cost of reproduction new, for no such work was undertaken and it is believed cost of reproduction new in such a case was never thought of until some forty-five years later. The cost of a property may be an item to take into consideration, but no one can justly claim that it is determinative. Common experience teaches every one that some properties are worth less than cost, some more than cost. The foregoing considerations have been sketched with the utmost brevity to call attention to the reasons why the convention through its committee adopted as the standard for measuring the amount of securities which should be issued by the new company for the property turned over to it, the value of the same according to the notion of value universally entertained in those days, and therefore necessarily awarded to each consolidating company the amount which in their judgment represented the fair value of the property it contributed to the new ownership. As things were viewed in those days, no other course was open to them and one may venture to remark the same is substantially true of consolidations to-day and will remain so for ll time. If one will ask himself on what basis he would proceed if he were charged with the duty of negotiating such a deal there will be no dissent from this view. Section 6, of the Consolidation Act has such important bearing on the fixing of the value of the several roads that an ommission to notice it would be serious error. It provides that if any stockholder, at the meeting of stockholders, or within twenty days thereafter, shall object to the consolidation and demand payment for his stock, he or the new company may apply on reasonable notice to a special term of the Supreme Court for the appointment of three persons to appraise the value of his stock. The court shall appoint such appraisers who shall meet at the time and place designated by the court and they or any two of them after being duly sworn, shall estimate and certify the value of such stock at the time of the Stockholder's dissent. The new company shall pay to the stockholder as directed by the court. Such appraised value and the stock may be held or disposed of by the new company. Much of the stock of the old companies had a market price largely above par. It is inconceivable that the appraisers would or could have fixed the value of such stock at less than its market value. If they fixed it at say 150 of par value the company would have been obliged to pay $150 for a one hundred dollar share and for it but one share of the stock of the new company could have been issued. If any considerable number of those holding such stock had dissented it is easy to see the new company would have been swamped in the launching. This provision of the act made it compulsory by its practical possibilities, that the stockholders hould not only vote in such numbers as to ratify the agreement but that those not so voting or consenting, should not in any substantial number avail themselves of section 6. The consolidation agreement must necessarily give every stockholder the fair value of his stock in some form or one of two things would be most likely to follow; either the stockholders' meeting would not ratify it or if it did a large minority would elect to take the appraised value of their stock with disastrous consequences to the new company. This is a dilemma which confronts every voluntary consolidation and also every involuntary one unless legislative power is ample to compel a stockholder to surrender his stock for less than its value and become a member of a new corporation against his will. There may be and doubtless are different ways of attacking the question, what constitutes the exchange value of a property. In arriving at a determination different persons will arrive at different results but unquestionably they will all rely upon earning power and in the case of a corporation the price its stock commands in the open market. These, of course, will be interpreted and modified by surrounding conditions and circumstances. In reaching a final agreement there will necessarily give and take to some extent. Just what the roads were valued at is easily ascertainable from the Consolidation Agreement. The new company is required by that to issue securities and assume indebtedness as follows. The question presented is whether $30,772,803.15 was the fair and reasonable value of these properties in May, 1853. The earning power bearing upon this question is that the net income from operation of all the operating roads for the year ended September 30, 1852, was the sum of $2,260,696.50. This sum is equivalent to 7 per cent (the legal rate of interest at that time) upon $32,295,665. In reaching this result of net income, it should not be forgotten that the Buffalo and Lockport was only in ocnstruction and had no revenues; that the Rochester, Lockport and Niagara Falls was in operation only three months and its net was only $36,295.13 and that the Schenectady and Troy had a deficit of $5,990.02, which is deducted from the total of the other roads in computing the above net income. The operating results for the year ended September 30, 1853, were not known at the time of the consolidation, but we presume the several companies knew what they had earned net up to April 1, 1853, during the six months then elapsed fo the fiscal year and in any event the net for the entire fiscal year, is cogent evidence on the question of the earning power of the roads. That net income was $2,608,754.50, an increase of $348,058 over the previous year and is the equivalent of 7 per cent upon $37,267,921. The Consolidation Agreement recites the difference in prices of stock of the various roads as a reason for issuing the debt certificates. Those prices, of course, varied from time to time in 1852, but the maximum quotations which have been found for that year are, Albany and Schenectady 112 1/2; Utica and Schenectady 145; Syracuse and Utica 135; Rochester and Syracuse 125; Buffalo and Rochester 120; and Rochester, Lockport and Niagara Falls 107 3/4. It is such evidence as the foregoing that the companies acted upon in reaching a value of $30,701,150 for all the roads and which made it seem just and equitable to over 2400 stockholders that they should have something tangile to represent that value beyond the $23,000,000 of stock. The abolition of canal tolls, effective December 1, 1851, had begun to show results in increasing freight business; the opening of western roads was beginning to show favorable results; the new company was planning to put the three millions to be received from the stock subscriptions into additions and betterments designed to take care of this growth, actual and anticipated. It did not expect to increase rates to meet additional interest or dividends and did not increase them. Such was the point of view held by the persons directing and planning the consolidation. The foregoing does not cover the cases of the Mohawk Valley and the Syracuse and Utica Direct. They had no roads to value; the stockholders were to pay only par for their stock, and in and of themselves they were not and could not be entitled to the debt certificates which were issued to them. It is but just and fair to explain as briefly as possible the reasons upon which that action was based. Taking first the Mohawk Valley, in the sketch of that road its relations to the Utica and Schenectady have been fully shown. It was practically a part of that road, its stockholders were mainly the stockholders of the Utica and Schenectady. In the convention at Syracuse the two companies were treated as one as is shown by the memorandum reported by the committee. No other road objected to this treatment nor to the allowance of 55 per cent in debt certificates. It is impossible to believe they would have assented to this without a word of objection unless there was some existing reason why they would not be relatively harmed by it. That reason may be readily stated, but first it should clearly appear just how much the two roads together took by the consolidation. If the Utica and Schenectady chose to allow a part of that to which it was entitled to go to the Mohawk Valley, we have a complete explanation why the other roads made no objection to the issue of debt certificates to the Mohawk Valley to the amount of $866,250. If the issue of debt certificates was justifiable, the fact that some of those to which the Utica and Schenectady was entitled went to the Mohawk Valley, is not the subject of just complaint. In fact it made no difference except as noted below to those who were stockholders in both roads. It benefited those stockholders in the Mohawk Valley who were stockholders in the Utica and Schenectady and to the extent of that benefit the amount going to its stockholders were diminished. Why this course was taken must probably always remain a matter of conjecture. Here again the introduction of the Syracuse and Utica Direct into the consolidation did not increase the amount of certificates required by the basis upon which the consolidation was made. The case of the Buffalo and Lockport is not so clear. It received certificates to the amount of $168,750, being 25 per cent upon its capital stock of $675,000. This most likely was in consequence of its relations to the Rochester, Lockport and Niagara Falls to which it was undoubtedly a subsidiary by reason of the undiscovered contract between them. But just how the Niagara Falls road's value was ascertained and what it was fixed at we do not know. The reasonable infeence seems to be that the Utica and Schenectady and the Syracuse and Utica made some concessions to these roads on account of their recent construction and that this was one of the modifications in allocating an agreed total which generally become necessary in concluding difficult arrangements. Frank Walker Stevens. "The Beginnings of the New York Central Railroad: A History" G.P. Putnam's Sons, New York, 1926.